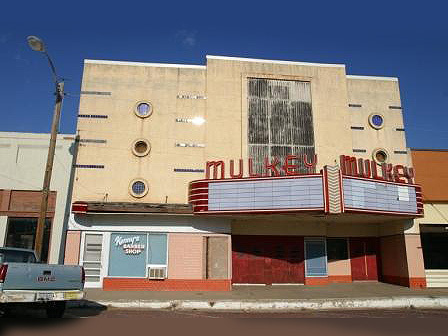 The Mulkey Theatre first opened its doors on February 13, 1946 and for the next four decades remained an important cultural center for the city and surrounding area of Clarendon. The Mulkey Theatre is a 1946 Streamline Modern Style building and is located between two of downtown’s oldest buildings. The theatre closed in 1986 and since then has deteriorated due to harsh weather and time. Pieces of the marquee and a poster frame have fallen off the façade. Most of the neon lighting has been destroyed due to vandalism and hail damage. Poor drainage at the rear of the building has caused settling in the foundation and large cracks in the walls. In the late 1990s, an unsuccessful effort to re-open the theatre resulted in the loss of the original seats, equipment, and the movie screen. In 2008, the Clarendon Economic Development Corporation purchased the building with the hope of rehabilitating and re-opening the theatre. Recently, the roof has been replaced to prevent further deterioration of the building. Unfortunately, further funds to revitalize the building are limited. It is believed that saving the Mulkey Theatre will protect the city’s heritage and will boost the economic vitality of the community. Visit the Mulkey Theatre’s Facebook page. Since 2012, the Clarendon Economic Development Corp. has invested over $250,000 into the restoration of the exterior facade and lobby of the Mulkey. The local visitors center and Chamber of Commerce have relocated there, and plans to renovate the interior as a theatre and event space are underway. The goal is for a complete restoration by 2015.